Mobile Money Consulting is a specialist mobile financial services consultancy focused on maximising revenues for clients operating in this rapidly expanding sector. Working at the intersection of the Mobile, Banking and Technology industries, our unique experience allows us to assist clients in developing the appropriate strategies to position themselves correctly and take full advantage of mobile payments. With the industry reaching a critical inflexion point Banks, Payment Companies, Technical Vendors, Telecom Operators and Corporates should act now to correctly position themselves to take advantage of this opportunity. We have just launched a new digital strategy agency Digital Baobab, to enable clients to develop the right digital products for their markets. Visit our new site to find out how Digital Baobab can help you. 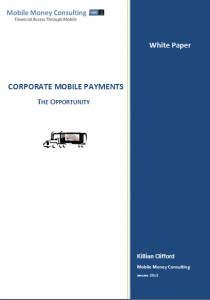 Stop Press: Mobile Money Consulting have just released a White Paper on Corporate Mobile Payments. Get your copy by clicking the icon. Also, see our interview on the subject with CFO Insight in our media section.